A House and Yard: What's Growing in the Yard? What's Growing in the Yard? 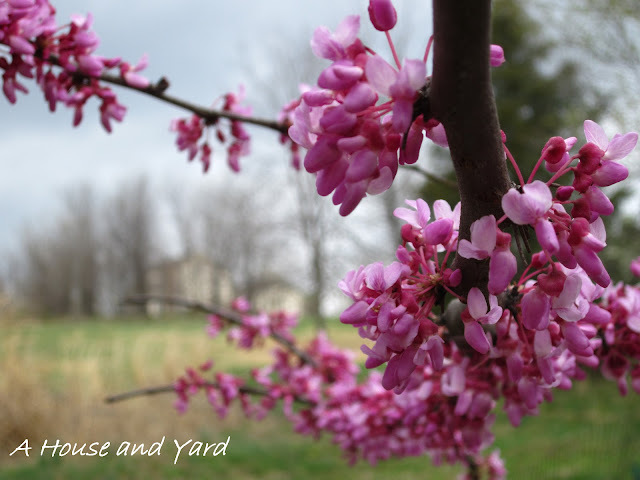 Spring has sprung in the yard! I have been anticipating new growth this first Spring season in our yard. Besides Grandma's peonies, which are coming up beautifully I might add, there are things popping up all over the place. I know the names of some of the blooms, but will have to wait until the others decide to show their pretty faces before I can name them. The peonies by the front step are the tallest so far. However, every one on the divided plants is growing like crazy! I'm so excited to show you more when they finally bloom. 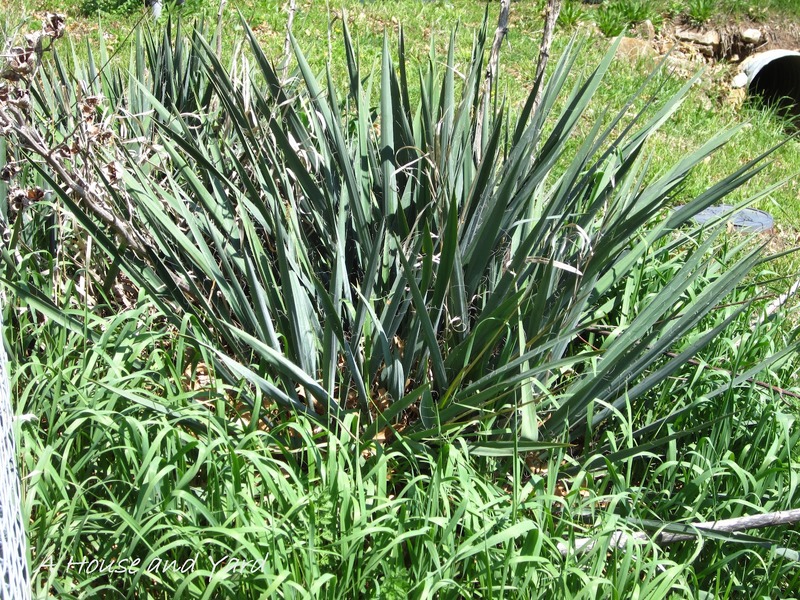 Can anyone out there give me a good reason to keep this yucky yucca that's growing at the front fence? 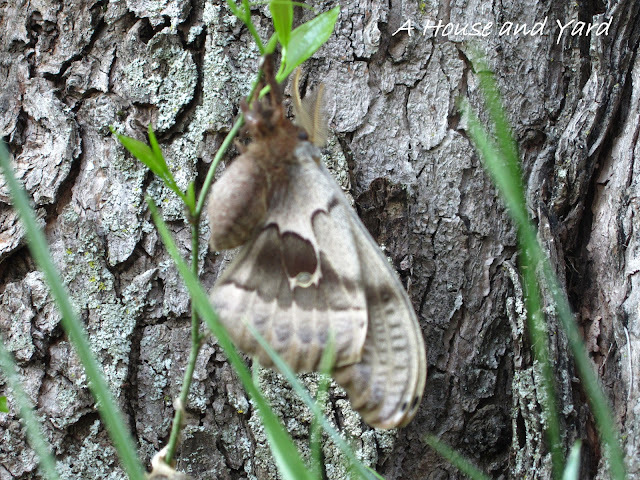 We discovered this moth just emerged from it's cocoon. It was about four inches from antenna to wingtip. but it was being private. I was thrilled to find out this beauty was in my own backyard. porch had burst into yellow blooms! 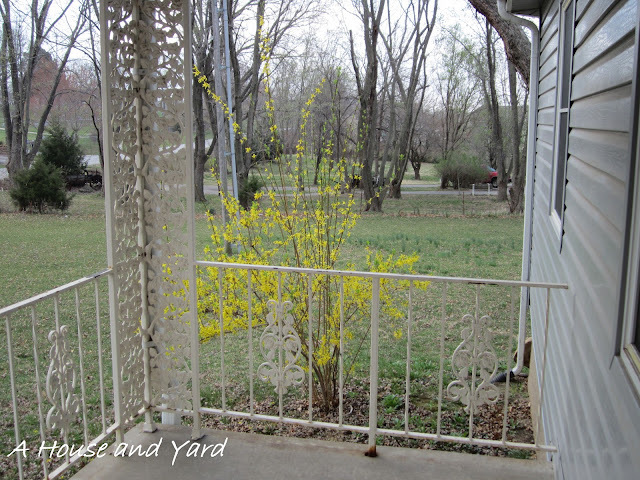 Nothing says "Hello Springtime" like forsythia. 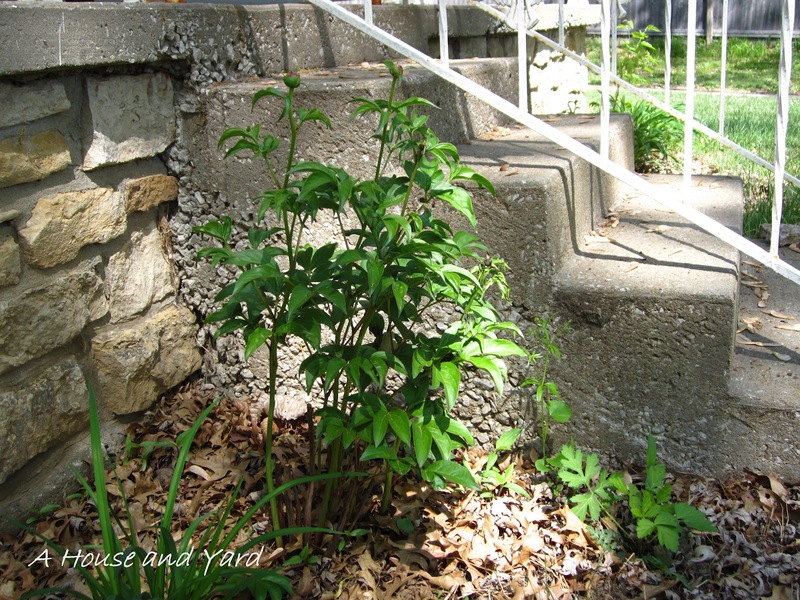 Plants aren't the only things growing at A House and Yard. 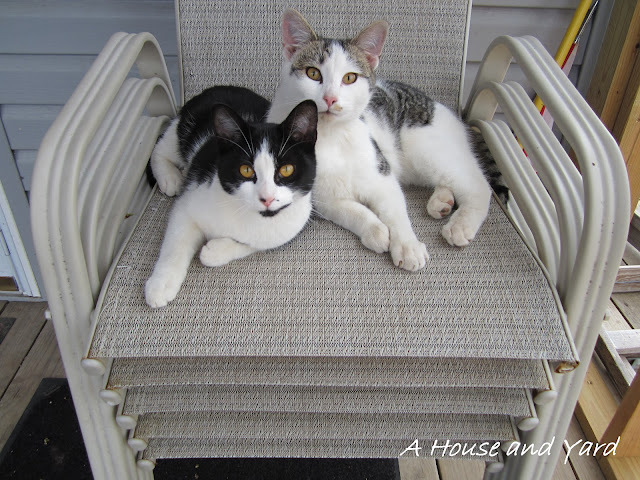 Bonnie and Clyde are getting bigger every day. in all his glory was not dressed as beautifully as they are. I hope this Spring finds you happy and blessed! Beautiful pictures. I love spring! I've always LOVED lilacs but never had a bush of my own. We moved into this house 6 years ago in June which is after the lilacs are gone. 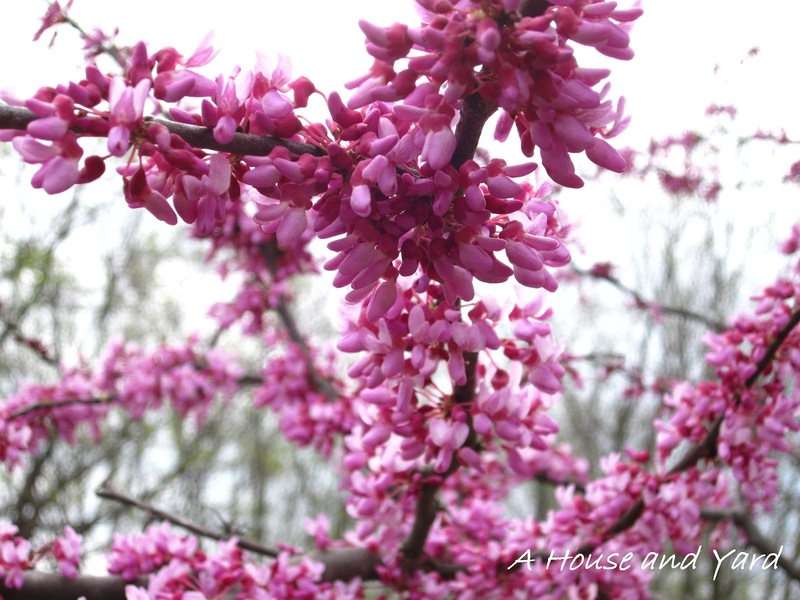 I was so excited the following spring to discover I had lilac bushes in my yard! How fun! Lilacs are one of the things on my wish list. You were lucky to spot the moth! 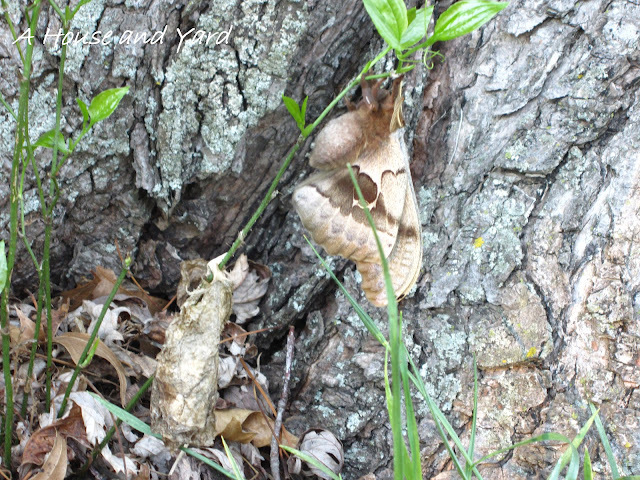 I'm really out of practice but my guess is it's a saturniid moth, maybe a polyphemus. They are the same family as Luna moths. Hi Alecia! Thanks for the info on the moth; I had no idea about it's name. It was an amazing discovery considering it blended in so well with the tree. Beautiful pictures! Maybe you can come over and help me get MY yard/flowerbeds in shape...they are in dire need! Thanks for the inspiration! Well, we could probably work out a trade. There are no official flowerbeds here @ A House and Yard. I get to start from scratch, but at least there are some plants to get me going. 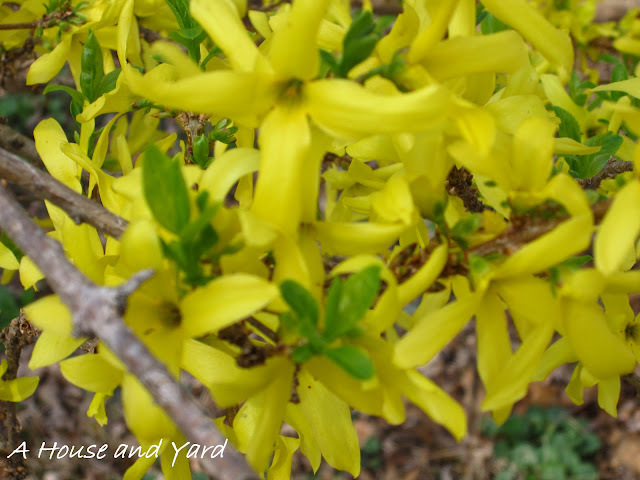 Love your Forsythia! I love flowers and shrubs however, I don't like Yucca and you have my permission to take that baby out!But I do love grasses! Thank you very much for permission to ditch the yucca! :-) I absolutely adore grasses, too, and those are on my list with the lilac and the daffodils and the iris and the daisies and the black-eyed susans and the.... Well, you get the idea.